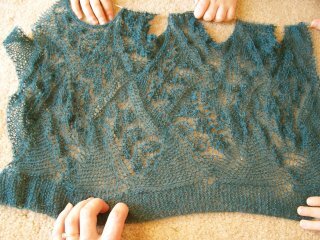 With a lot of blog talk lately on WIPs, like how many you have, I bring you a new feature here on Alianne Knits - WIP Wednesday where I show you a few of my works in progress. Maybe it will keep me from forgetting about some WIPs for new projects. Madli is somewhat close to being finished, so I'll save her picture until she's all nicely blocked out, hopefully sometime next week before we leave on vacation. First, I begin with the Wool Peddlar's Swatch, um, Shawl. I have about 65 of 110 garter stitch rows done, then I do the lace edging. 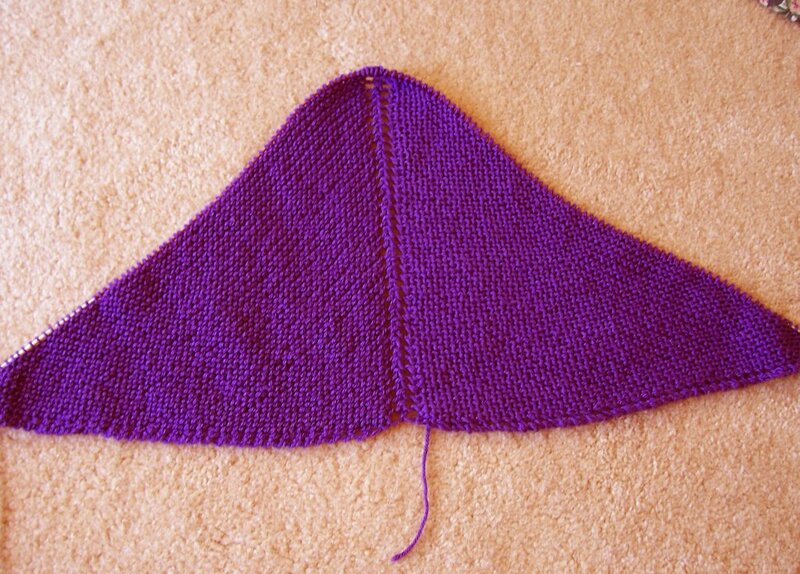 I love the color and I think the finished shawl will be lovely and will certainly be heavier than my usual shawls are. Next is the Forest Path Stole. This entrelac project is really quite amazing, but each little rectangle seems to take quite a while. Both WIPs are lovely. Having a slighly heavier shawl is a good thing though. I sometimes use my Charlotte's Web as an alternative to a jacket in the fall. You can use your Wool Peddler's the same way. What yarn are you using for the Forest Path Shawl? It looks lovely! i like your wip wednesday idea. and that entrelac shawl is gorgeous. I've been aching to start the Forest Path Stole, but other projects seem to keep pushing it to the back burner. Yours is simply gorgeous. Thanks for reminding me how lovely it is. Oh wow... I bow to the Goddess of Lace! I lovelovelove that purple - and where would we be without the magnificent Folk Shawls?? Hey, it's a WIP - you don't have to pin until you block!! The Forest Path Stole is one of my earliest web discoveries back in 2003. And the yarn for it is my very first online purchase. Sadly, this shawl requires so much attention I couldn't knit it now. Yours looks terrific so far and I'm sure it'll look magnificent when done. Wow, you have some really pretty WIPs - I love them both, but especially the Forest Path Shawl - this one's going to look so gorgeous! both shawls look wonderful! i applaude you for making through all that garter stitch! i'm totally loving the forest path shawl.